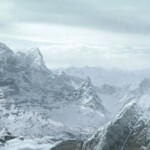 Though the point-and-click adventure was diagnosed with a terminal illness at the end of the 90’s, recent times have seen a resurgence in the format. Double Fine’s high profile Kickstarter raised money that few others have exceeded, in pursuit of adventure game gold. The Walking Dead, which is built in an adventure game engine, is getting Game of the Year buzz. Meanwhile, publisher Wadjet Eye Games has been busily releasing independently developed point-and-click adventures now under its label for half a decade. Their newest offering, Primordia, was developed by Wormwood Studios. It was also recently Greenlit for distribution on Steam, showing support for both the format, and the game itself. I’ve spoken a bit about Primordia before in my interview with Mark Yohalem, where I got to check out an early preview of the game. With my first impressions I mentioned a few things that stood out to me about the game so far: writing, art style, and voice acting. Now that I’ve gotten to play the entire thing, here are my thoughts! Primordia stars Horatio, a robot with an uncertain past who lives in a post-apocalyptic (or at least, post-human) wasteland. He’s a tinkerer, with the adventure game propensity to pick up random items and build things with them. He isn’t alone in his exile; he has built for himself a floating robot sidekick named Crispin, who assists with solving puzzles. Crispin’s ability to float and his small stature means he can reach locations that Horatio can’t, so he can be used almost like an additional inventory item. Horatio lives on a crashed ship in the desert called the UNNIIC. When the game starts, he’s doing repairs when a mysterious but aggressive robot suddenly boards the ship. This robot, Scraper, steals the power core from the UNNIIC’s engine and takes it away across the desert, into the city of Metropol. Horatio’s quest to retrieve the power core seems straightforward at first. Of course, it doesn’t turn out to be so easy. From an interaction standpoint, Primordia reminds me the most of SVGA-style adventure games (in my youth, I mostly played the Sierra ones, so I previously referred to King’s Quest V as the natural comparison). But there are some modern touches. A fast-travel system allows the player to reach key screens quickly. Inventory scrolls off-screen when not needed, so as not to disrupt the view. And, thankfully, no one is going to ask you any copy protection questions. Adventure games typically feature inventory and logic puzzles. When playing this kind of game in the 90’s, I always took extensive notes. That was my impulse here, too. Then I realized that Primordia has an internal note-taking system that writes down any important clues and codes in an in-world datapad in the inventory menu. This came in handy when there was a code I needed but forgot to write down myself. I think the game found the right balance between being fair while still encouraging me to think things through. Primordia, being set in a world of robots, does dole out a lot of numerical puzzles, but none them require more than basic math. My favorite puzzle in the game, though, is the one that requires some wordplay and typing. It’s just the interactive fiction fan in me. If a player gets totally stuck, there is an in-game hint system. Click on Crispin, and he might offer a useful in-game hint. Other times he might just complain he has no ideas right now. Unfortunately I found this didn’t always perform to my expectations. The frustration here is that Crispin is context-sensitive. Sometimes he was great and suggested exactly what I needed to follow up on. Other times, he suggested a hint that wasn’t relevant to the current situation, or something I thought I’d already tried. While I’m talking about frustrations, my own biggest frustration in almost any puzzle-based game is when I know exactly what I’m supposed to do, but not exactly how to do it. In Primordia, it took me a few hours of play time to realize that using the right click was a way to inspect something in my inventory. I guess years of playing adventure games made in Flash have taught me that the right click operation isn’t needed. Then I proceeded to get stuck in Primordia because I didn’t ever try it. I put this here as a word of caution so you won’t follow in my footsteps: right click on things! Now that I’ve banged on about puzzles a bit, I’ll talk about the thing players are going to notice right away: the visuals. 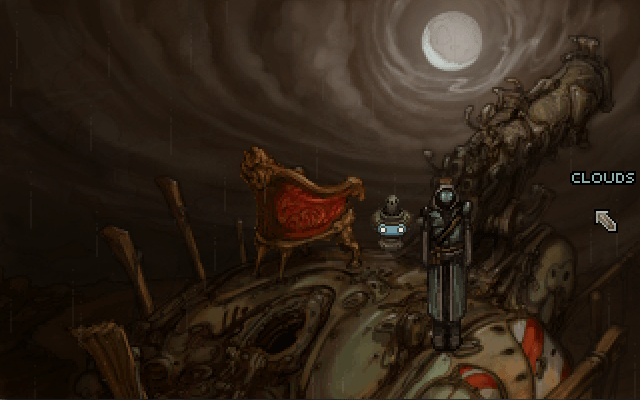 Primordia is a really pretty game. The color palette is thoughtfully unified, mostly rust colors and warm grays, with the occasional accent of red or blue. The huge amount of brown in the game may not be to everyone’s liking, but it does give the game a sense of visual unity. High-fidelity pictures have been down-rezzed into pixel art – both for nostalgia’s sake, but also to simplify the animations of the characters. The robot designs have a lot of variety, from humanoid types to glorified Roombas. Everything – buildings, robots, items – is intricate with pixel-painted detail. Much like the gameplay, the art is a well-executed blend between old and new sensibilities. I really enjoyed the characters and acting in the game. Most characters have a little hidden depth that isn’t otherwise apparent. The voice acting is all top-quality. Horatio is voiced by Logan Cunningham of Bastion fame, who is the most well-known of the voices. But I thought all the cast did an excellent job. Crispin’s patter was often chuckle-worthy. And, yeah, I liked Clarity. I like it when an adventure game character, just on occasion, treats violence as a valid puzzle-solving option. She’s like Renegade Shepard as a gynoid. 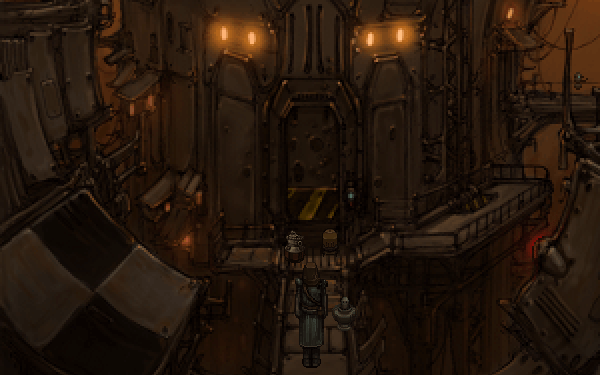 Primordia has a lot of varied influences, both in games and outside of them. There are some on-the-nose dialog homages to Fallout and MST3K. The Crispin character, meanwhile, is more or less a combination of Cedric from King’s Quest V and Morte from Planescape: Torment. (As well as a sarcasm module from Tom Servo (really).) Developer commentary admits as much, discussing the history of the Flying Little Sidekick trope throughout the years. Right: developer commentary. Adventure games have a lot of focus on static puzzles, so they’re usually best the first time. But Primordia has given some nods to replayability, and the above-mentioned developer commentary track is one thing that breathes a little life into a second play through the game. Some puzzles in Primordia also have multiple ways they can be solved, which encourages retries. 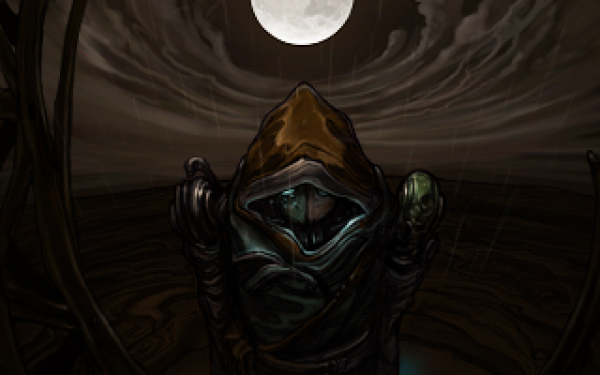 Primordia also has an achievement system, which includes a unique achievement for one of each of the multiple endings. Since the achievement system doesn’t respond to “save scumming,” one would have to play the game through several times to unlock everything. I’m not entirely sure that would be worth it, since I can see the endings even if I don’t get the achievements. I will definitely finish the game a second time, however, just to hear all the commentary and see some of the puzzle solutions I didn’t try. Okay: I should clarify that. When it was over, I immediately started it again. My playtime on this one, as it often is, is just an estimate. It includes one and a half playthroughs, as well as the time that I occasionally spent just staring at the screen trying to figure something out. It’s not an enormous game, and your playtime will vary depending on how quickly you solve puzzles and how completely you explore. Still, it’s big enough to feel like a fully realized world. You can buy Primordia now from Wadjet Eye Games. There’s a digital and a CD version available. Or you can wait for the Greenlight to go through and buy on Steam. Those who buy the DRM-free version get a Steam key when they are available. You know, I’ve been sort of interested in this ever since your interview, and now that it’s out I have to add it to my list. Of course I’m buried in games right now, so there’s no telling when I’ll actually play it, but it sounds like a great example of how the point and click style is resurrecting itself. It’s certainly wonderful to see enough willing players come out of the woodwork to support the format that this sort of game would be Greenlit on Steam. Thanks for the tips on the right-click, Amanda. I was completely puzzled (ahem) at the start of the game because Horatio just seemed to dismiss everything I clicked on. Then I remembered: right-click! Then came the explanations. Ahhh, that makes sense. Anyway, I quickly warmed to Crispin Horatiobuilt and Horatio Nullbuilt. Robots have excellent names. I’ve decided that I will build my own: Crapulent Boonebuilt. I forgot that Mr. Cunningham was going to voice the protagonist of Primordia. He was obviously wonderful in Bastion; no surprise he’s become somewhat of a commodity in the independent sphere. Glad to hear you enjoyed this one, as I’m very much looking forward to a few coffee-fueled December evenings with Primordia. Well, xtal, if it helps ease your mind, there’s a difference between regular intelligence and adventure game logic intelligence. I have played enough of them that I usually solve things fairly quickly… though I did ask Crispin for help from time to time! I do really like the naming standard for robots and how you can tell who is in what “family.” I’m also a big fan of having inventory items with more than one use in a game like that torch. You’re certainly right about the resurgence of the traditional adventure game. It may not be as mainstream as it was, and you won’t see Activision or EA putting one out, but who cares? Despite all the talk about consoles winning, the only truly fail-proof platform is PC. Oh, and the game looks very pretty. I’m irrationally drawn to post-apocalyptic settings too.